Walter G. Moss is a professor emeritus of history at Eastern Michigan University a Contributing Editor of HNN. For a list of his recent books and online publications (over 300), click here. His most recent book is In the Face of Fear: Laughing All the Way to Wisdom(2019), which treats humor from a historical perspective. 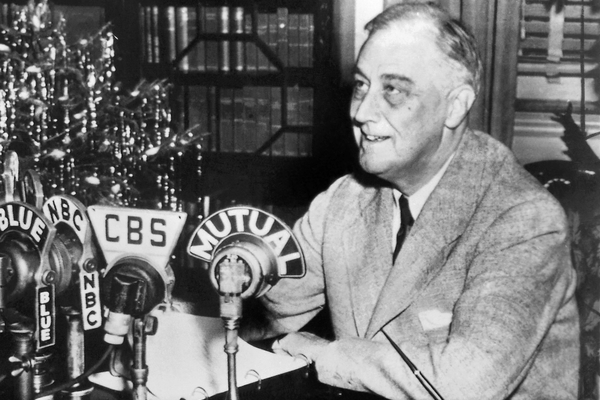 Franklin Delano Roosevelt delivering a "Fireside Chat" to the American people. This sounded much like Lincoln. At a cabinet meeting he once said, “I don’t propose to argue this matter because arguments have no effect upon men whose opinions are fixed and whose minds are made up.” Instead, he told a story to illustrate his point. Both great presidents possessed an acute understanding of the common people. Lincoln’s came partly from his origins among common frontier folk, but the aristocratic Roosevelt, who campaigned extensively throughout the nation, “principally relied on his feel for public mood to guide him in leading the country.” Yet both presidents understood that to reach people, to motivate them, to win them over, a president had to appeal to their emotions, and storytelling was one way of doing so. Carl Sandburg, who wrote a six-volume biography of Lincoln and was a strong FDR supporter, saw numerous parallels between the two presidents, especially their attunement to the will of the American people. The answer is simple. Our problem is that we keep forgetting it: Most people’s politics are not based on reason or rationality. This was a good part of the message of former HNN editor Rick Shenkman’s book Political Animals, as well as earlier ones like Predictably Irrational andThe Righteous Mind. In contrast to Obama, President Reagan did pay more attention to the irrational and to storytelling, as Jan Hanska emphasized in Reagan’s Mythical America: Storytelling as Political Leadership (2012). Historian Koch agrees: “Like FDR, he [Reagan] was a great storyteller.” He used stories “to look backward to an earlier time to promote ideas of self-reliance and free enterprise.” President Trump, though not much of a storyteller, also appeals to myths about America’s past—note all the “Make America Great” hats worn by his supporters. But how does storytelling help political leaders? Lincoln provides some interesting insights. He believed it often helped “avoid a long and useless discussion . . . or a laborious explanation.” Moreover, it could soften a rebuke, refusal, or wounded feelings. Influenced by Aesop’s fables, as well as the parables of Jesus, Lincoln intuitively understood that to sway the American public simple stories were often more effective than reasoned arguments. As he once stated, “They say I tell a great many stories . . . but I have found in the course of a long experience that common people . . . are more easily informed through the medium of a broad illustration than in any other way.” In his emphasis on Lincoln’s storytelling ability and the humor that often accompanied it, Schutz notes that they reflected his ability to identify with the common people, his appreciation of their practical bent, and his good-natured acceptance of the flawed human condition. In a 2016 HNN essay, historian Harvey J. Kaye argued that “the time has come for progressive historians and intellectuals to join with their fellow citizens in the making of a new American narrative,” one that would “encourage renewed struggles to extend and deepen American democratic life.” We now have at least one such narrative, Jill Lepore’s These Truths: A History of the United States (2018). In two earlier HNN essays (here and here), I wrote of the need for a new “compelling, unifying vision that a majority of Americans would embrace.” It would build upon the visions suggested in the 1960s by Martin Luther King, Jr. and Robert Kennedy, which foreshadow Lepore’s “new Americanism.” In addition, it might sprinkle in the spirit of Carl Sandburg (1878-1967), “the one living man,” according to Adlai Stevenson, “whose work and whose life epitomize the American dream.” It would also recall other qualities that our country has demonstrated in its finest moments such as tolerance, compromise, pragmatism, generosity, and a willingness to undertake great tasks. Today we again need to demonstrate both the idealism and compromising ability of the Constitution makers. Our present climate-change crisis provides such an opportunity. The Democrats’ Green New Deal reflects our idealism and willingness to once again take up a great task—as FDR did in fighting the Depression and mobilizing U. S. power in World War II. But transforming this idealistic resolution to effective legislation also requires political compromises. As various Democratic presidential contenders vie for the 2020 nomination, we need at least one of them to provide a unifying vision. Being a storyteller able to relate to and inspire most Americans, like Lincoln and FDR did, would also help create a “new Americanism.” So too would a Republican change of heart about compromise, a word most of them have rejected for far too long.